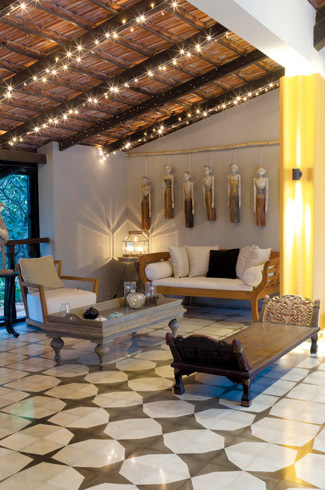 Mumbai-based firm SiCiDi Architecture breathes new character into a charming old family bungalow in Alibaug. The speed boat skims over the grey waters of the Arabian Sea and within minutes the fishing trawlers and the ferry boats have shrunk to toy-sized proportions. The South Mumbai skyline fades away and Alibaug appears on the horizon. 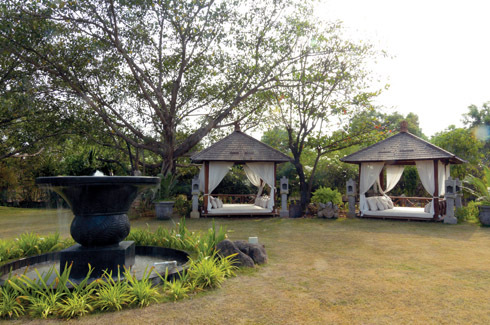 The drive from the jetty towards Alibaug town is dotted with squat bungalows, orchards and fields. Towering palms in the distance mark the pristine beaches that lure Mumbai folks here over the weekend. 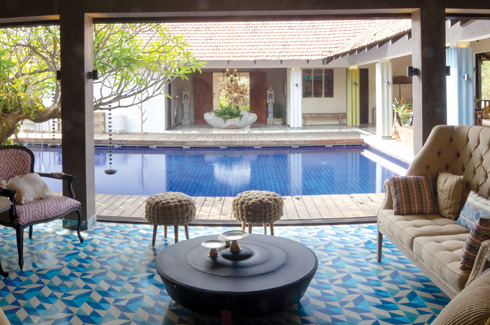 When SiCiDi Architecture were roped in to redo an old bungalow in prime Alibaug they were keen that the visual construct of the house reflect the weekend getaway, beach vibe of its location. 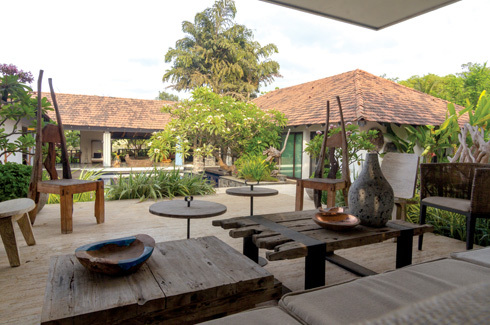 Located amidst a sprawling 5-acre piece of land, the original bungalow was oozing with charm but lacking in character. The entire space was laid with drab gray Kota stone and lack of planning had created small pockets that made the house look shrunken. 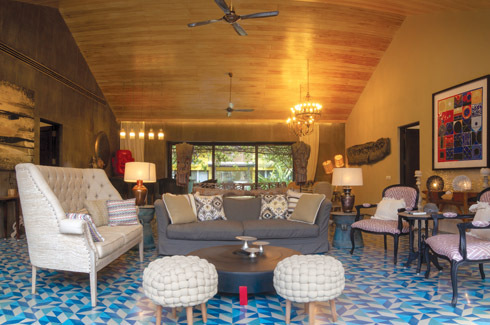 Muninder Chowdhry and Vishakha Dholakia, the principal architects of SiCiDi Architecture could immediately spot the possibilities that were waiting to be uncovered. “We went to the drawing board intent on maintaining the charm, while redirecting the flow of energy through the house. 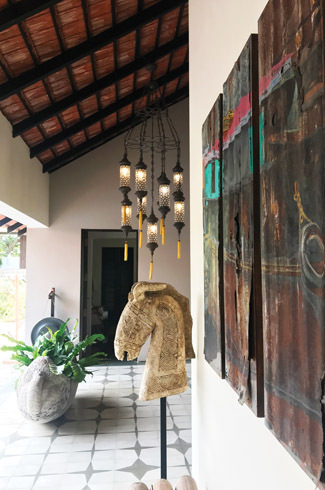 It was also important that the space have a farmhouse feel, distinctly different from the client’s city apartment.” Muninder elaborates on the design process. 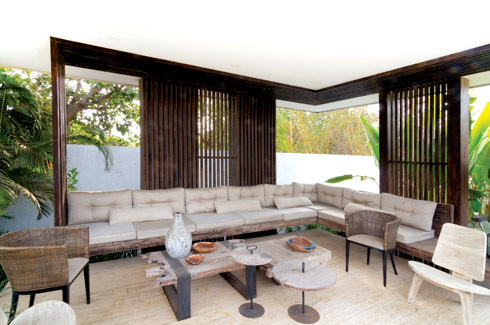 A key aspect of SiCiDi Architecture’s design philosophy is to ensure a synergy between the space and its site. 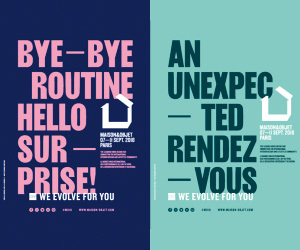 Another key element is their commitment to make sure that no two projects look the same, which is achieved by integrating the client’s personality into the project. The first step was to strip the house down to its bare bones and next to restructure it from the ground up. All the walls enclosing the verandahs were done away with. This opened the house up to the lush, green landscape on one side and the pool on the other side. 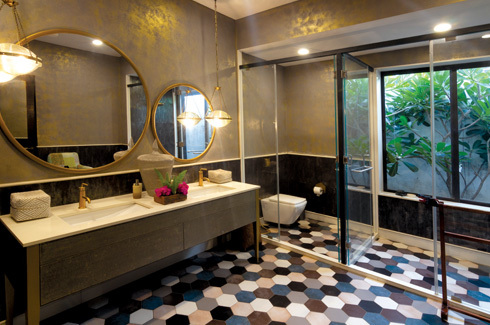 The new cement floor, in a contemporary pattern, which starts inside the house and extends to the outdoors, further blurs the inside-outside divide and gives one the sense of being both indoors and outdoors at the same time. The original bedrooms had been fitted with false ceilings which cut off the height that the pitched roof provided. 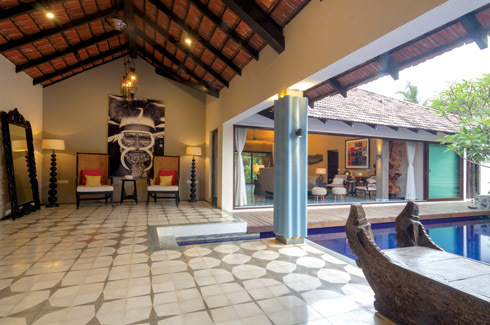 SiCiDi removed the false ceilings and used a lightly distressed wood underside to highlight the scale, height and angles of the original roof and add to the rooms’ volume. By replacing the original windows with ones that slid outside the walls one more boundary between the inside and the outside was eliminated. 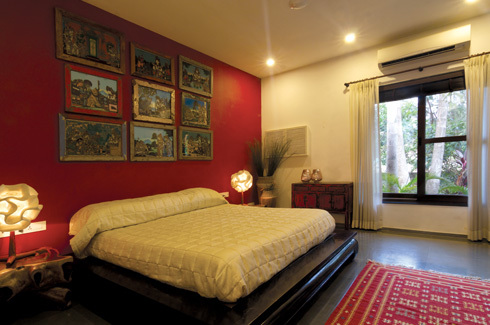 A splash of colour, different flooring materials and distinctive statement furniture pieces and adornments lend a unique character to each of the bedrooms. 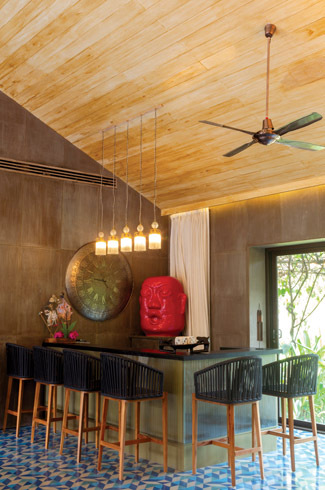 A herringbone brick flooring, a tessellated pattern on the stone on the bar, Brazilian Ipe on the pool deck, lightly distressed cement sheet wall panels, wooden roofing rafters and corrugated sheets in light pastels on the columns – all come together to add texture to the space and infuse it with an element of fun and surprise. 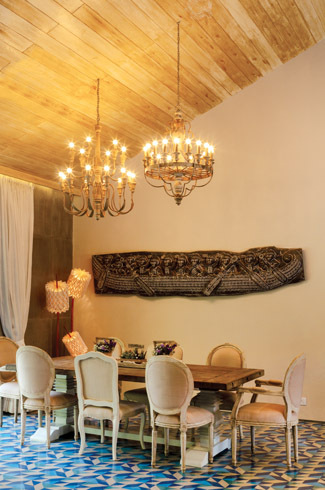 All the art and sculpture that occupy the walls and different corners were carefully selected after considering their relevance to that space as well as the house on the whole. This trust combined with a clear vision for the project has resulted in a comfortable home that in equal parts reflects both old world charm and modern day elegance.